It's that most wonderful time of the year where everyone starts talking about the best way to make their bird moist (!) and as usual, we vegetarians get bad press for being all "bah humbug" about the sheer lack of imagination when it comes to christmas dinner menus or options for christmas. So we'll probably be doing what we usually do, opting for something veggie en croute (usually lentils, vegetables and a good strong stock with some puff pastry to top it off). Over in the states, the above thing actually exists. The Tofurky. 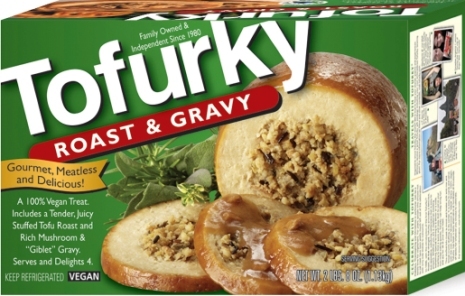 A 'mock turkey' roll that usually has stuffing in it, is boiled in a sort of vacuum packed 'skin' and probably tastes exactly how it looks. We tried the Quorn version of this a few years back in total frustration at not finding anything better, and it did not go well. It was like eating gently cooked polystyrene. We can, of course, go completely mad with the roast vegetables and sides (though last year the attempt to make the sacred 'pigs in blankets' au veggie was pretty disastrous, bacon flavoured wood = not good). It's such a shame I can't eat meat (for allergy reasons) and The Strolling Mum just plain doesn't like it and has been vegetarian since her teens. Charlotte, however, will be wolfing down turkey like it's going out of fashion, lucky girl! So what do other veggies out there do? Any recipe suggestions most gratefully accepted!